The Flushing waterfront is targeted for development. Don’t be fooled by the name: Main Street in downtown Flushing is decidedly nongeneric. One of the busiest commercial strips in New York, Main Street’s shops and restaurants cater to the 69 percent of Flushing residents who identify as Asian, particularly the neighborhood’s sizable Chinese and Korean populations. 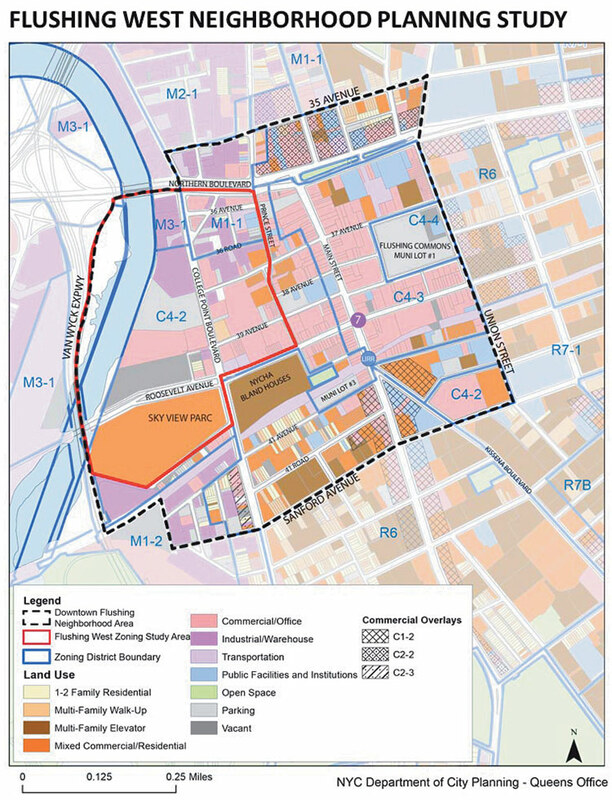 As in East Harlem, East New York, and Long Island City, the Department of City Planning (DCP) is studying rezoning possibilities for Flushing West. The DCP would like to activate underutilized industrial space along the waterfront, giving the downtown room to grow westward. Flushing’s new zoning proposals aim to spur mixed-use growth. The Flushing West Neighborhood Planning Study (FWNPS) is building on a master plan initiated in 2011 by the Flushing-Willets Point-Corona Local Development Corporation. With a $1.5 million Brownfield Opportunity Grant, the LDC tapped SHoP, AKRF, and Mathews Nielsen to study zoning and land use between Flushing Creek and downtown Flushing. 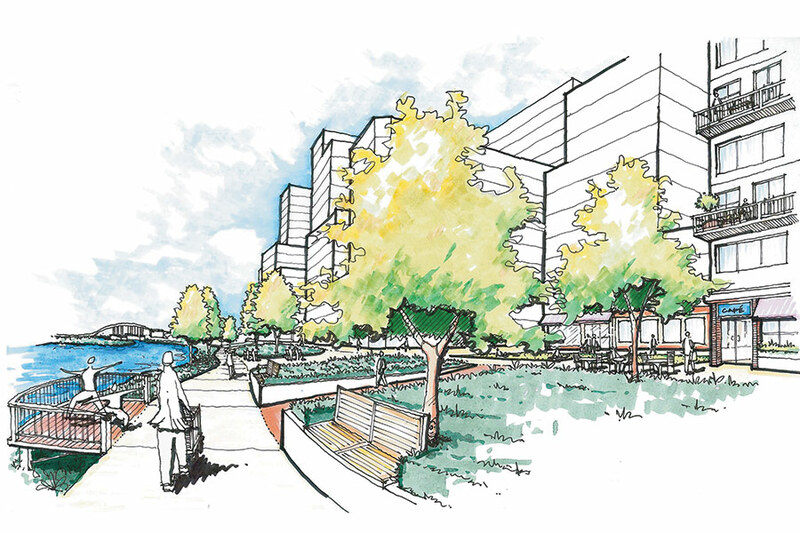 The master plan outlined strategies to spur economic development, add affordable housing, improve city services and infrastructure, and broaden access to the waterfront. The FWNPS is now in its environmental review and public scoping phase. The plan’s rezoning proposal targets a 32-acre, ten-square-block area east of Flushing Creek, bounded by Northern Boulevard, Prince Street, and Roosevelt Avenue. Since May, the DCP has invited residents to articulate Flushing’s core needs in a series of public meetings. Residents identified primary concerns, like building more housing for seniors, preventing displacement of small businesses, improving streetscapes for pedestrian safety, creating separate bike lanes, building more recreation space, and cleaning up the heavily polluted Flushing Creek. Thomas Smith, director of studies for the DCP’s Queens office, explained that existing zoning in downtown Flushing “already allows for a significant amount of development potential.” The zoning encourages hotels (because of a low parking requirement), and buildings with wide, low bases topped by residential units. New zoning would encourage similar mixed residential-commercial development, and adhere to current land use near Northern Boulevard: heavy manufacturing on the waterfront and light manufacturing inland. Those fearing a Williamsburg- or Greenpoint-style tower building boom need not worry. Airport zoning for LaGuardia, across Flushing Bay, sets restrictions on the height of buildings in adjacent neighborhoods. Besides poor water quality, the affordability of affordable housing is a top community concern. Smith explained that the rezoning would allow for affordable housing rates at 25/60 or 30/80. Translation: In some new construction, 25 percent of units will be available to households making up to 60 percent of the Area Median Income (AMI), or, 30 percent of units will be available to those making 80 percent of the AMI. In 2015, the AMI for a three-person household in New York City is $77,700 for a family of three. If approved, the plan could add 938 total units of housing. Of those units, 516 to 619 units would be permanently affordable. A coalition of community organizations has formed the Flushing Rezoning Community Alliance to speak out on the zoning changes that could negatively impact current residents. The DCP hopes that, after a public comment period, the neighborhood plan will be approved by fall 2016.